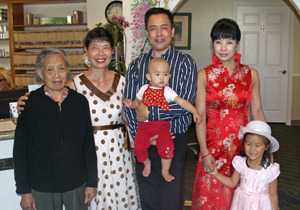 As an adult, Yueling Chen has not only realized that childhood desire to speak English and come to America, but much, much more. And while she doesn’t drive a pink car she is definitely China doll beautiful, and her mastery of the English language, along with many other things she has accomplished in her life, are feats to be admired. No matter one’s stature, everyone’s life has a narrative, and Yueling’s story is one that involved a deep-seated desire to run as fast as she could. This penchant for running did not go unnoticed. The school officials in her village soon became aware of Yueling’s athletic ability, urging her to represent her school in competition in the town of Tieling. While competing there she caught the eye of one of the town’s coaches, Kui Wang, and was invited to train and compete for the province of Liaoning, and eventually for the entire country of China. For a preteen, the morning to night training involved in competing was grueling. Her coach tolerated no excuses, acknowledging no mention of aches and pains, and although plagued with persistent low back and knee problems Yueling persevered. Loving the excitement of the competition, her desire and determination to keep running kept her going. Perseverance, dedication and the years of intense training eventually paid off at the international competition level. Sixteen-years-old at the time, Yueling Chen won her first Gold Medal in the 10K Women’s Racewalk at the 1989 Asian Track and Field Championships in New Delhi, India. With that win it was decided that she should prepare for the 1992 Olympic Games, and that preparation would lead to more success with the winning of another Gold Medal for the Women’s 10K Racewalk at the 1990 Asian Games in Beijing, China. Continuing on, 1991 found Yueling participating in her first international event outside Asia, where she was awarded a Silver Medal in the World Student Games in Sheffield, England. It was to be her final major preparation before the Olympics. 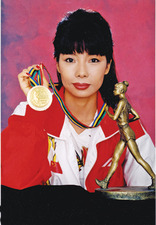 In 1992, as a member of the Olympic team representing the People’s Republic of China, Yueling Chen became the first Chinese athlete or Asian woman to win a Gold Medal in an Olympic track and field event. Upon achieving this pinnacle of athletic success, she became a national hero in her country. Her life was profiled in a 30-minute special filmed by a major Chinese TV production, and broadcast throughout China. And … she became the only living athlete to receive the honor of having a life-sized statue (a replica of her in racewalking stance) prominently displayed in her home village. But in spite of these accomplishments and fame, she never gave up her dream of speaking English and living in America. Leaving success and family behind, Yueling came to the U.S to attend Brigham Young University in Provo, UT. From there she moved to San Diego, CA, where she attended Palomar College to gain further command of the English Language and acquire skills for a business career. While living in San Diego, and working as a Director of Asian Marketing for Imagenetix, Inc a distributor of health and nutritional products, Yueling was invited by a mutual friend to come and meet someone working in Dr. Fu’s acupuncture clinic in San Clemente. That someone turned out to be, Dr. Qin Fu the man she would eventually marry. “My friend had tried to get us together once before, but I had decided not to go. When I finally met Qin, I looked at his shoes, remembering that someone had told me if a man wears rounded shoes, he will be a good husband and father, but if his shoes are pointed, not so good. Qin’s shoes were rounded,” Yueling laughed. Although it was love at first sight, it would be a few years before the couple married, as Yueling Chen still had many goals to reach. Coming out of a six-year retirement in 1998, in spite of persistent low back and knee pain she rededicated herself to train for the 2000 Sydney Olympic Games. This Olympiad would see women compete in a 20K racewalk for the very first time. Having set the fastest 20K time in the world on a 400 meter track at the ARCO Olympic Training Center in Chula Vista, CA, she reached the Olympic “A” Standard and qualified for the U.S. Olympic Trials and a spot on the U.S. Team. She went on to win the Silver Medal in that event. As a high profile athlete, Yueling has lent her support to many charities, foundations and organizations. Joining Governor Arnold Schwarzenegger, Eunice Kennedy Shriver and Sergeant Shriver, she participated in the Great Wall fundraising event for the Special Olympics, as well as conducting racewalking clinics for the athletes involved. She has served as spokesperson for the 3KWalk & Talk4Seniors to raise money for the Senior Olympics, and supported the Susan B. Koman Breast Cancer Foundation (Race for the Cure) and the Juvenile Diabetes Foundation (Walk to Cure Diabetes) by walking in their respective fundraising events. Yueling has also been a commentator for ESPN, and once a year is interviewed to appear on Chinese National TV. While she has met and associated with lots of Olympic champions and other celebrities throughout her career (among them Olympic Champion Carl Lewis, and Audrey Hepburn after whom she modeled herself, but one of her proudest moments came when she was invited to the White House to meet President Clinton. In 2004, after a long courtship Yueling was finally ready to put her high profile life on hold, and she and Dr. Qin were married in a traditional ceremony in Guangxi, China, her husband’s hometown. Over 1,000 people attended the wedding, including the Mayor. Finally a couple, the duo presently resides in San Clemente near the beach, quietly raising two little girls, Leann, 4 ½ and Jasmine 8 months. Having lived with constant low back and knee pain and difficulty sleeping during her competitive years, Yueling has finally found relief through acupuncture treatments and massages administrated by her husband, who recently opened a new clinic in town on El Camino Real.